iOS10 has been out for a long time and it’s an important update for iOS device. Apple introduced several new features in this latest version of iOS and if you haven’t update your iOS device to iOS10， I suggest you update to iOS10 as soon as possible as it brings in a lot of improvements. But there are risks when you update your device to iOS10, data loss, for one, is a everpresent risk you’ll have to take. So if you want to update to iOS10, you should probably make a backup of your device first. 1. “Press Home to Open” replaced “Slide to Unlock” on lock screen. 2. 3D Touch can be used to show hidden menu of notifications. 3. 3D Touch can be used to clear all notifications. 4. On iOS10, you can slide the lock screen to the right to open camera without unlocking your iPhone. 5. Now third-party app developers can get their hands on Siri. As I mentioned before, you should probably back up your iOS device in case anything bad happens during the iOS10 update. But if you did encounter data loss on iOS10, Here’s how you can recovery them to your iPhone. If you accidentally got your data on iOS10 deleted during the iOS10 update, there’s a chance that you can get them back. 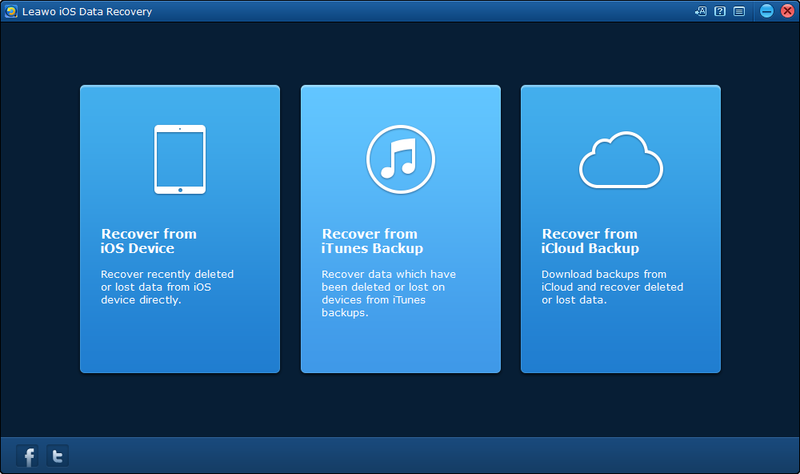 Leawo iOS Data Recovery is a powerful data retrieval program which can help you recover data from iOS device, iTunes and iCloud backup. If you haven’t backed up your device before updating to iOS10, you can try recovering data from iPhone itself, which can be done with the help of Leawo iOS Data Recovery. Check out the content below and see how to recover deleted data on iPhone iOS10. Step 1: Download and install Leawo iOS Data Recovery, open it and on the main interface, click on the first tab to get started on recovering data to iOS10 from your iOS device. 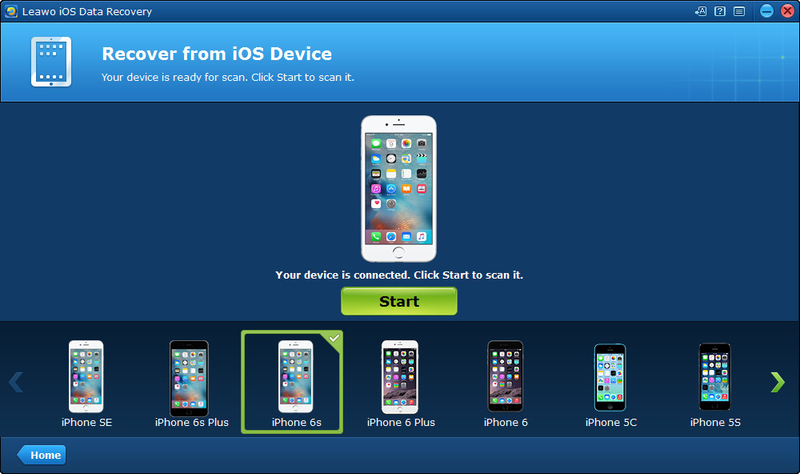 Step 2: Select your iOS device on the device list and click the Start button and the program would start scanning your iOS device. Step 3: After your device has been thoroughly scanned, the program will have all the retrievable data presented to you on the interface. They are divided into different categories on the left column. 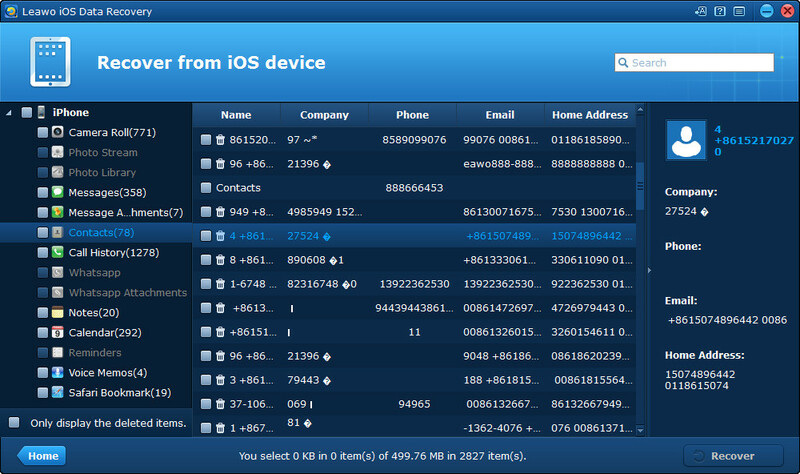 Choose the files you’d like to recover to your device on the file list. There are 8 types of data you can recover: Messages， Contacts， Call History， WhatsApp、Notes， Calendar， Reminders， and Safari bookmark. 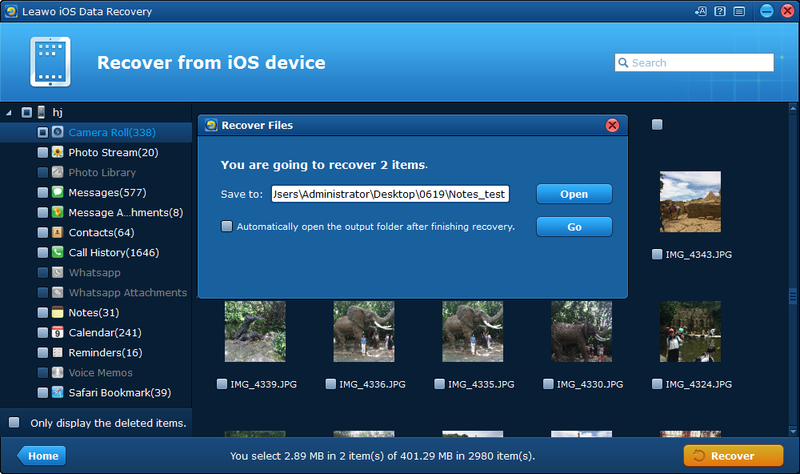 Step 4: After you’ve chosen the files to recover, click the Recover button at the bottom right and a window would appear. 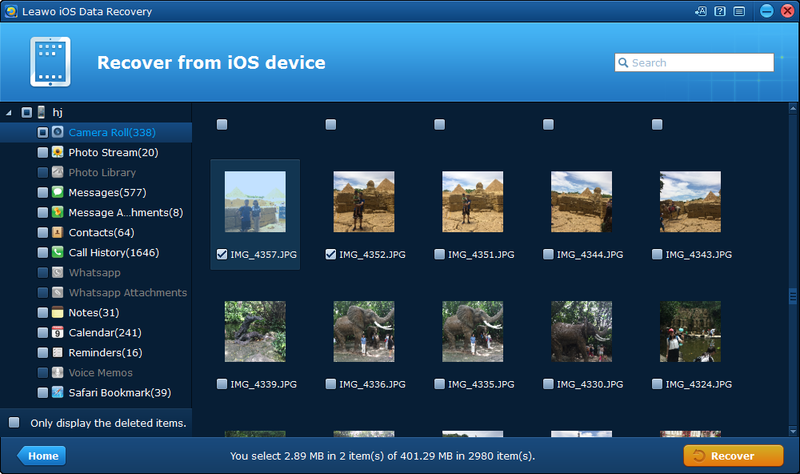 Step 5: The files you’ve chosen to be recovered to your device would be saved to your computer at the same time they are recovered to your iOS device. On the pop-up window, set directory for the files you’ve chosen to recover and click the Gp button to start the iOS10 data recovery process. Other than recovering data from iOS device itself, you can also recover data from previous iTunes backup to iOS10. With Leawo iOS Data Recovery, you can recover data from iTunes to iOS10 device with ease. There are in total of 8 different types of data you can recover:Messages、Contacts 、Call History、WhatsApp、Notes、Calendar、Reminders and Safari Bookmark. 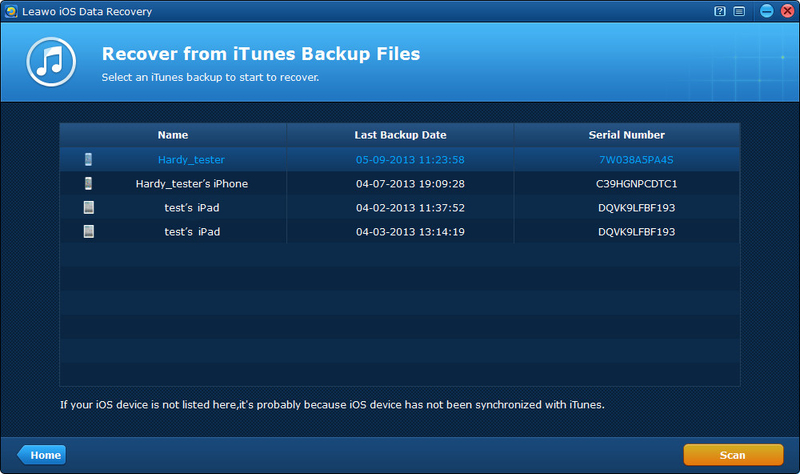 Step 1: Open the program and on the interface, click the tab in the middle to use the iTunes backup recovery mode. Step 2: All the backups you’ve created using iTunes would be listed on the interface, choose the one with the data you’d like to recover to your device and click Scan on the bottom right to scan the backup. Step 3: After the scanning process is finishd, you will see all retrievable data on the interface. 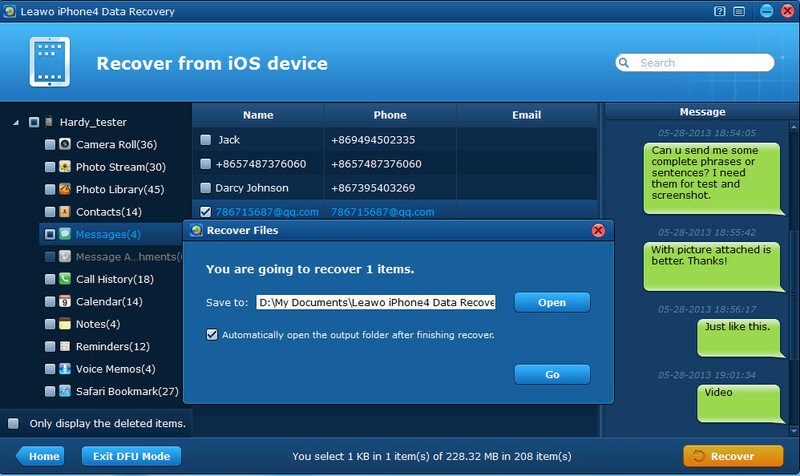 Choose those you want to recover to your device and click the Recover button. Step 4: a window would pop up and you need to set directory for the backup of the files you are about to recover to your device, just like you did in Part2. Ane then click Go to start recovering data to your device from iTunes backup. Now with the two methods of data retrieval on iOS10, you can easily recover lost or deleted iOS10 data on iOS device with ease.